My heart goes out to those poor businessmen sweltering in our humid summers, in their collared, long sleeved shirts, ties, and long pants in thick fabrics. Things you have to iron. Things you can’t bike in, unless you want to ruin them with sweat and chain grease. Big city workplaces are refusing to acknowledge the realities that most people’s commutes don’t happen from door to door in air conditioned cars. This leads to weird double standards, where skirts to the knee are professional and weather appropriate, but shorts are not, no matter how nice. And, because discrimination is bad, y’all, we jokingly, technically, allow anyone to wear either skirts or pants. But the policy is always told to men with a conspiratorial wink of “we both understand you’re not actually going to come in wearing a skirt.” Can you imagine a man being taken seriously in a professional setting while wearing a skirt? Seattle-area technology workers excepted, of course. There are people in my life for whom it would fit their gender identity better to wear skirts, at least some of the time. But even though it’s comfortable and feels right, there’s too much at stake in their careers. This illustrates a key principle of privilege: just because an oppressed group IS ALLOWED to do something, doesn’t mean it’s safe for them to do it. Danny breaks down some of the reasons why “but you can do what you want” is a weak argument — go read it. So how do we fix it? I think we should take a clue from the Swedish train drivers who recently made headlines. It’s hot in a train, but they were only allowed to wear skirts or pants. So, they all, en masse, switched to skirts. They created a culture where it was ok, and bam! It was ok. With a few dozen media stories, but still: progress! I want to hear from you. Men, tell us your skirt wearing experiences! Everyone, tell us your experiences of changing office culture! That picture of a dude wearing a skirt above looks hot, an added bonus to the comfort. I’m all for men in skirts! My boyfriend works for a large corporation and in the summer they allow all of the employees to donate a certain amount of money to the charity that the company supports, and in return they get wear casual dress to work for the summer months. Which I think is an innovative way to make office workers more comfortable in the summer. Technically, that is a kilt; actually, some variety of Utilikilt. That’s awesome, they actually look really good with workboots! Yes! I second that whole-heartedly. And it would also save on energy costs. I am a firm believer in the environmental and common-sense benefits of wearing (and being allowed to wear) weather-appropriate clothing. THIS. I am currently freezing in my office in clothing that was too hot when I was outside. WTF. I’m being punished for my impertinence by a new thermostat that controls both my boss’s office and my own, and a boss who wears suits and is going through menopause. The very first conference I went to after getting a real job, one of the speakers explained to us all that the reason we were all so cold is that air conditioning in hotels that hold conferences, and buildings where people work, and all, is set so that it’s comfortable for a man wearing a suit. It was a nice welcome to the total lack of sexism in the workplace. Oh wait. I used to wear skirts dancing quite a bit. And no, not utilikilts, REAL skirts of the kind usually reserved for women. I stopped at some point. I might start again in DC summers, because goddamn it’s hot here. But for some reason, while men wearing skirts is a totally accepted practice in the folk community, it’s basically unheard of in any other setting. It actually takes little for wearing skirts to normalize– some dance communities have had just two or three men start wearing skirts, and everybody else accepts it as totally normal shortly after. Somehow I doubt the same thing would happen for women attempting to challenge patriarchical standards of dress. 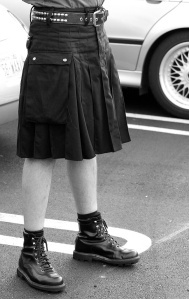 Men in skirts are indeedly warmly welcome at (e.g.) contra dancing and in the ‘folk community’ as labourdudedave points out. Also in countries like Nepal, Bangladesh, and Thailand, if you accept skirts as something about mid-shin length. Personally, I thoroughly enjoyed the ease with which I could wrap my legs and waist in a bolt of Barack Obama-themed fabric while living in Burkina Faso, although that was wardrobe for around the house – not in public. Man-wear was still collared shirts and long pants in 115 degree heat. As for home territory: t’would be laughable for a man to wear a skirt in the vast majority of all DC government / ngo / etc offices. But wearing one in DC in general…? Out of the ordinary, but do-able. I’ll wager, t’would almost certainly be associated with being gay. Length is definitely a consideration; If it were down to the ankles/shins, I suspect there would be no major comments, and perhaps not a strong association in people’s minds with sexual preference. If it were a nice/interesting fabric, some outgoing/liberal types might even compliment it**. If the skirt were short? Immediate association with drag. Buncha looks. Perhaps I’ll try the long-version, and report back… Anyone else want in? Man-Skirt parade at my favorite cafe near U-Street! **note: all assumptions/guesses are based on how I identify (white, heterosexual, male, overly optimistic) and where I’m living (near U Street and Columbia Heights). Thanks for the post, and the site in general. Yes! I (a female) almost always wear skirts or dresses, and at least once per semester, I will have a student comment on it. They’ll usually say something like, “Do you even own pants? You’re so girly!” I will respond, “I’m not girly. I’m just comfortable.” Then, I’ll try to spark a class discussion about culturally-conditioned modes of dress – why are skirts only deemed appropriate for girls? How arbitrary is that? Why was it deemed unladylike for women to wear pants at one time? If that attitude can change, why not the attitude toward men in skirts? 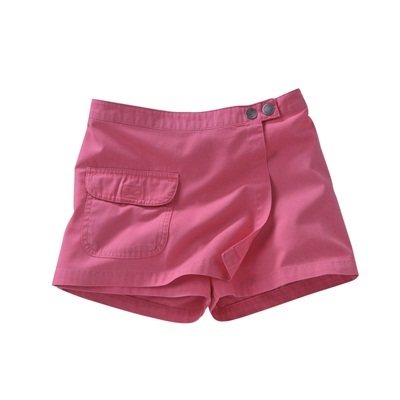 Why was pink, for so long, a boy’s color, then only a girl’s color, and now more and more accepted for both gender? I’ll usually end by exhorting the men in my class to start wearing skirts and explain how much more comfortable they will be in the sticky summer months. They usually end by looking at me like I have a baby arm growing out of my forehead. In Australia, we have and will be having a very hot summer. Women will wear breezy dresses to work and out to social occasions. Men will wear a suit or long trousers. In a country where power is expensive and we are all looking for a way to reduce green house gasses, the office and fashion designers are stifling the creativity and getting men into cooler clothing options. Much of it seems to be driven by the female objections in fashion magazines, papers and on the internet. Until this is reversed, men will never break out of the mold and get comfortable. I love wearing a skirt but only do it round the house. I am not so sure that the problem is female objections. I think the biggest problem is other men or our own perception of what other men and women will think or say. We are more likely to get the negative and rude comments from other men trying to display their masculinity by putting us down for choosing to step outside the box. I’ve been mostly skirted/kilted for over 11 years. For the past three years, I’ve only had one pair of athletic shorts. Which, in late August of this year, finally wore out enough that the inseam failed. So, at this moment, I have no trousers. Do I really care, not so much. I will eventually have to pick up a pair or two when the economy finally improves (if it ever does), so I can restart my employment search (been doing freelance computer repair work and photography lately). At the moment, I’m in a nightwatch camo Utilikilt and have three tartan kilts for cold weather/dress-up situations. Usually, though, I’m wearing regular knee-length skirts. Look good, are reasonably accepted in the Seattle area, and, if they get soiled, most of the ones I own, I can throw them into the washing machine and dryer. I’ve been fairly active on the lookbook site – http://lookbook.nu/Blue245Ti – Have a bunch of looks on the site. Nope, a skort is something with pants underneath, shorts in particular, under pants are fine, but trousers are pointless and for cowards. I am always amazed when I go dancing and the guys are pretty much all in jeans. I’ve managed jeans at blues once or twice, but forget it for Swing or Contra (where one sees more shorts or sometimes skirts). I’ve suggested skirts time and again at swing, but nobody has thought it would fly, not even utilikilts.